Do you have something special this week which is a treasure to you? If so, please link it below so we can share in each other's wonderful things. Be it something you have made, a photograph of something special or things you have collected like me. Look at the treasures I picked up last week at a charity shop. 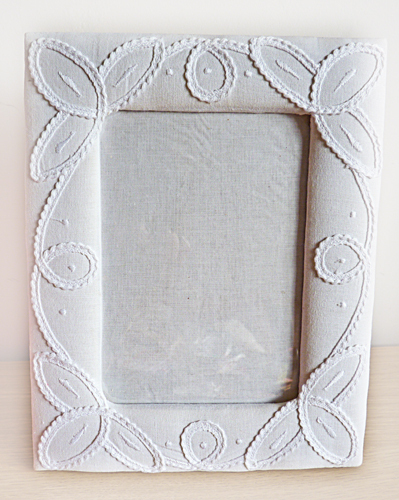 a fabric frame which was only £1.99. A bargain eh? This is how I have altered it. 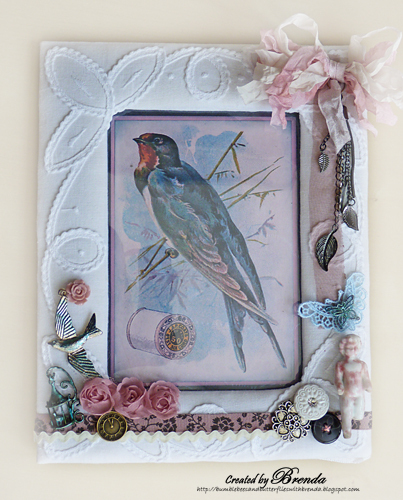 A vintage bird as the central image, a big shabby bow and lots of little embellishments. I would like to add this to Ali's blog Vintage Page Designs where she has a challenge theme of Birds. 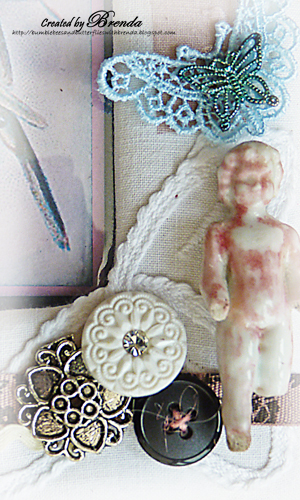 A lace butterfly from the Funkie Junkie's Boutique, old buttons, another of my frozen Charlotte dolls. 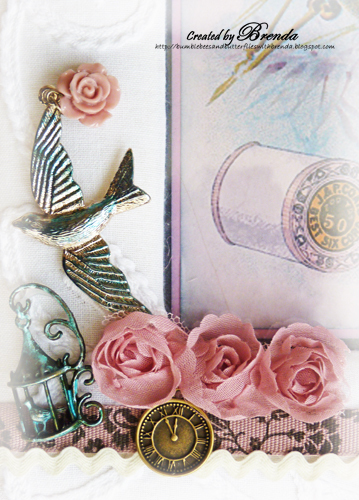 The bluebird and flower is off a piece of jewellery, there is also some trim and charms. I am looking forward to seeing your special treasures. Such a beautiful frame, you always find such wonderful things.Can't wait to see what you do with the bag.Apologies for lack of comments, life has been a bit hectic. 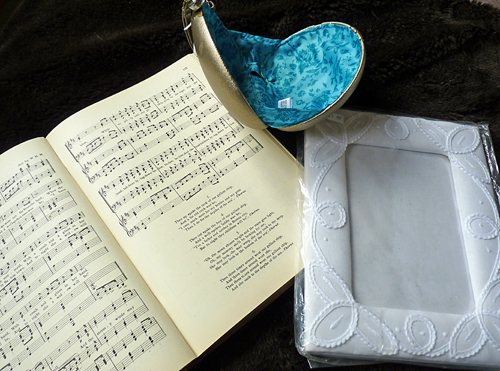 The frame looks great - but I want that book of music!!!! Can't wait to see what you do with it. Brenda, this is a beautiful transformation. Love how you framed the vintage bird with so many little embellishments. A true treasure! Hugs! Really a treasure, your altered frame looks wonderful. This looks gorgeous how you altered it Brenda! I love your finds, your artwork and the fact you have a linky here. Brenda, you made that frame a treasure! That frame is amazing! I love how you altered it. Thanks for your kind comments today! I like this Treasures idea! Fabulous idea Brenda and love your frame everything looks so delicate and peaceful. Oh my, this is absolutely lovely! What a gorgeous fabric frame you found and it makes a terrific background for your yummy collection of little treasures. Totally shabbily gorgeous, Brenda! I always love seeing what artists do with items from my shop. The blue lace butterfly is gorgeous! Thank you so much for sharing your beautiful work with us on Sunday Share! A gorgeous frame - love all the embellishments!